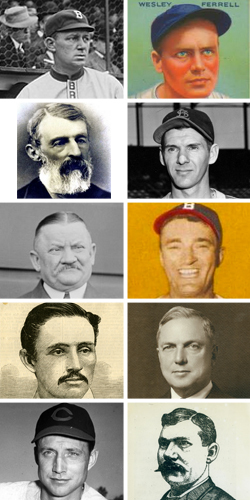 Six former big league players, three executives and one of the game’s earliest organizers comprise the 10-name Pre-Integration Era ballot to be reviewed and voted upon Dec. 7 at the Baseball Winter Meetings in Nashville, Tenn.
Doc Adams, Sam Breadon, Bill Dahlen, Wes Ferrell, Garry Herrmann, Marty Marion, Frank McCormick, Harry Stovey, Chris von der Ahe and Bucky Walters are the candidates for Pre-Integration Era Committee consideration for Hall of Fame election for the Class of 2016. Dahlen, Ferrell, Marion, McCormick, Stovey and Walters are included for their contributions as players, while the other four are inclusions for their off-field careers. All candidates are deceased. Any candidate to receive votes on 75 percent of the ballots cast by the 16-member Pre-Integration Era Committee will earn election to the National Baseball Hall of Fame and will be inducted in Cooperstown on July 24, 2016, along with any electees who emerge from the 2016 Baseball Writers’ Association of America election, to be announced on Jan. 6, 2016. Click on the links above to read SABR bios for the candidates, when available. Doc Adams was voted as SABR's Overlooked 19th Century Base Ball Legend for 2014; Bill Dahlen was selected as the Overlooked Legend in 2012 and Harry Stovey in 2011. SABR's Overlooked Legend in 2010, Deacon White, was elected to the Hall of Fame in 2013 by the Pre-Integration Era Committee. The Pre-Integration Era ballot was determined this fall by the Historical Overview Committee, comprised of 11 veteran historians: SABR members Bob Elliott (Toronto Sun); Steve Hirdt (Elias Sports Bureau); Bill Madden (formerly New York Daily News); and Tracy Ringolsby (MLB.com); along with Dave Van Dyck (Chicago Tribune); Rick Hummel (St. Louis Post-Dispatch); Jim Henneman (formerly Baltimore Sun); Jack O’Connell (BBWAA secretary/treasurer); Glenn Schwarz (formerly San Francisco Chronicle); Jim Reeves (formerly Fort Worth Star-Telegram); and Mark Whicker (Los Angeles Newspaper Group). The 16-member Hall of Fame Board-appointed electorate charged with the review of the Pre-Integration Era ballot will be announced later this fall. For more information, visit BaseballHall.org. This page was last updated October 9, 2015 at 3:15 pm MST.